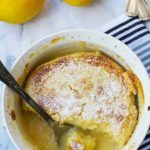 Last Friday, I did what I often do when it comes to an evening meal for Mr. Scrummy and I. I schemed and planned in my little down-time moments (aka day-dreaming at my desk) throughout the day what I was going to cook. But by the time I got home, I was so exhausted in that Friday night way that we all know only too well that, well, let’s just say I wasn’t bounding into the kitchen full of the joys of spring to roast my chicken that I’d just bought in quite the same energetic fashion that I’d imagined earlier in the day! ‘Forget roasting a chicken, let’s just get a takeaway,’ said thoughtful Mr. Scrummy. ‘Oh no, that’s OK, it won’t take long to do,’ she replied, still totally convinced that the words coming out of her mouth were true. But as pots and pans and carrots and potatoes and half lemons to shove up a chicken’s bottom flew, and half an hour ticked over to an hour … and the rest … OK, yes I did regret my earlier enthusiasm. A lot. Because, as we all know, Friday is the night for flaking out on the sofa with a pizza and a movie. Not roasting your own chicken and all the trimmings. Silly me! But … and now here’s the point … IT WAS WORTH IT THE NEXT DAY. Because what did I have then? Lots of lovely juicy leftover roast chicken of course. Which really did turn out to be super handy because Mr. Scrummy and I were painting our apartment that day ready for renting as we prepare to leave Greece and settle in the UK. It was pretty useful to have something to throw into a quick dinner at the end of all the hard work. Trust me, though, like any pesto this really was easy. And truly delicious, too, if I may say so. 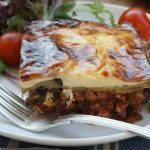 The sauce reminded me a little of a usually-smoky and sometimes-creamy dip we have over here in Greece called ‘melitzanosalata’ (say ‘mel-itz-an-o-sal-AT-a’), or aubergine salad. Basically, very similar to the Middle Eastern Baba Ganoush, if you’re familiar with that at all. All I did to make this simple beauty was roast a small diced aubergine together with a diced courgette for about half an hour. Why the courgette? Well, to be honest I just had one in my fridge, so decided to add it in. You know, extra veggies and all that. 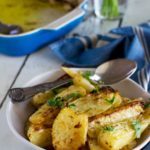 I do like courgettes but they don’t have the most memorable flavour when mixed in with other things, so I suspect you could leave it out of this recipe if you didn’t have one and that would be just fine! I then whizzed the roasted, diced veggies in the food processor with a handful each of walnuts, parmesan cheese and fresh herbs (looking back at my photos, I see that I used mint and oregano, but you could use whatever you have), a small garlic clove (or half a clove if you prefer to be on the conservative side with raw garlic in pesto) and a squeeze of lemon. Af-TA, as the Greeks say … that’s it! 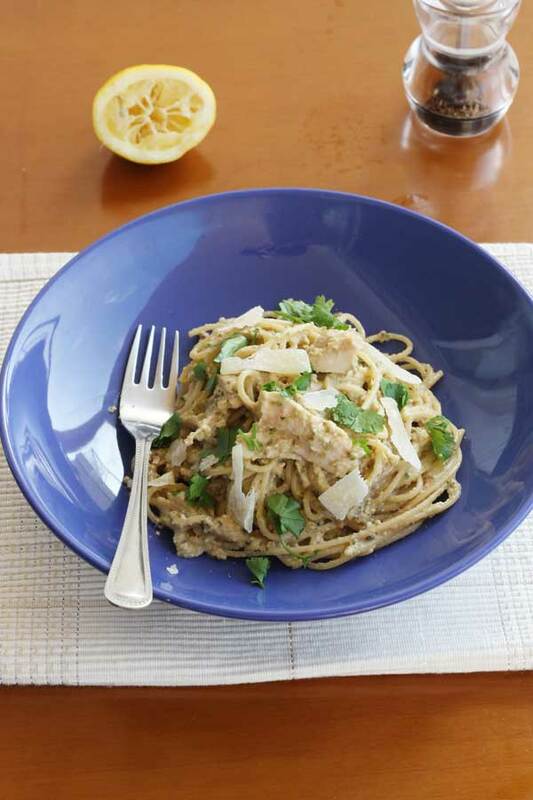 Then, stir the pesto sauce through your hot cooked pasta, adding a little reserved cooking water to make the sauce a little silkier, throw in your leftover chicken and heat through in the pan a little. Serve up your dish, then scatter over more parmesan and some chopped parsley and you’ve got one very delicious and fast Saturday-afternoon-while-painting-the-apartment meal. Or any-day-while-doing-(almost)-anything meal, of course! And if you’d like to see where I live here in Athens, Greece, just look carefully at this next picture because just about the whole neighbourhood is reflected around the edge of the dish! Ha! Yes, I did forget that this particular dish, a pretty shade of blue though it is, doesn’t behave itself very well in that sense. If you look closely on the left side, you’ll also see that it was a lovely sunny day with only a cute little wispy cloud in the sky! There are two things left to say here. Three, actually. 1. This pesto could very happily double up as a dip to eat with tortilla chips or raw veggies or whatever you usually like to dip into dips. 2. This recipe actually makes quite a lot of sauce. I stirred it all through the spaghetti, but you might want to save a little and use the rest for said dip. 3. You really don’t need to add chicken to this dish. It would still be super tasty without it! In other words, you don’t need to become Friday-night-crazy-lady-or-gentleman like I did in order to create this deliciousness! So, am I the only one to begin something a bit over-ambitious for the moment (not necessarily just cooking) and regret it? I know, probably just me on a Friday night. And … what dishes do you like to make to use up your leftover roast chicken in? Yes, I’m definitely looking to milk my readers (looking right at you!!) for all their great ideas! Oh, and by the way, I decided I couldn’t put off joining Twitter any longer and … oh my goodness, that thing is mighty addictive! Why didn’t anyone warn me?! 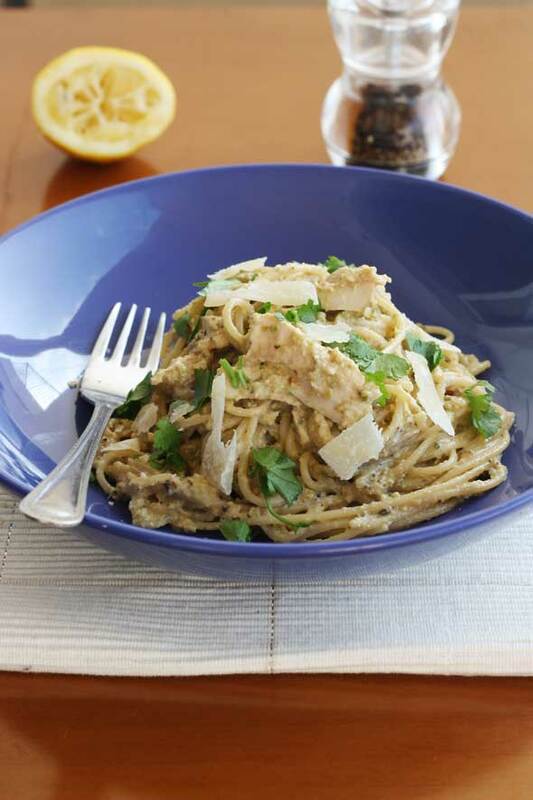 A different way to serve spaghetti – enrobed in a creamy, smoky aubergine-and-walnut-based pesto sauce. This dish has echoes of Middle Eastern Baba Ghanoush and definitely has the delicious factor! leftover roast chicken I used about 2.6 ounces/75 grams per person, but use as much or as little as you like - or have left! Pre-heat the oven to 390F/200C. Put the aubergine and courgette together on a baking tray, drizzle with a little olive oil and roast for 30 minutes or until the aubergine is nice and soft. Put a pan of water on to boil for the spaghetti, then cook according to the packet instructions. 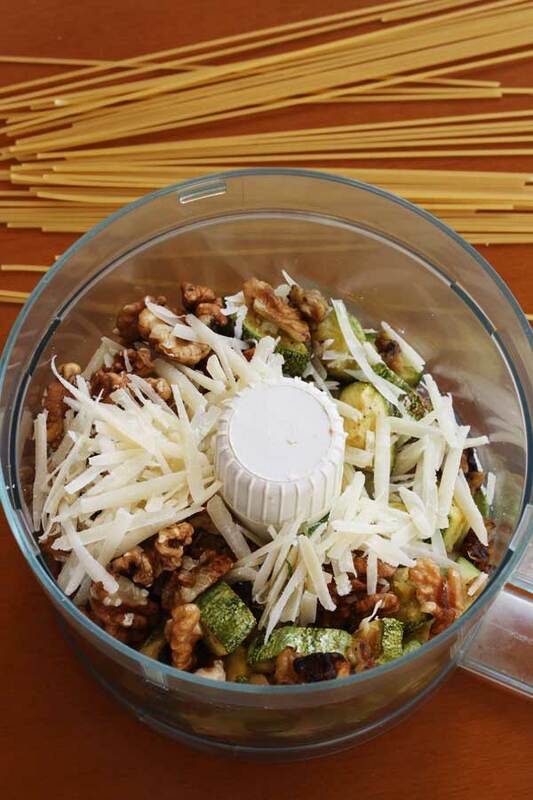 While the spaghetti is cooking, put the roasted aubergines and courgettes, walnuts, parmesan, herbs, garlic, lemon juice & pepper in a food processor and blitz until it forms a paste. Then, with the motor running, add the olive oil a little at a time until the paste has the consistency of a thick pesto sauce. 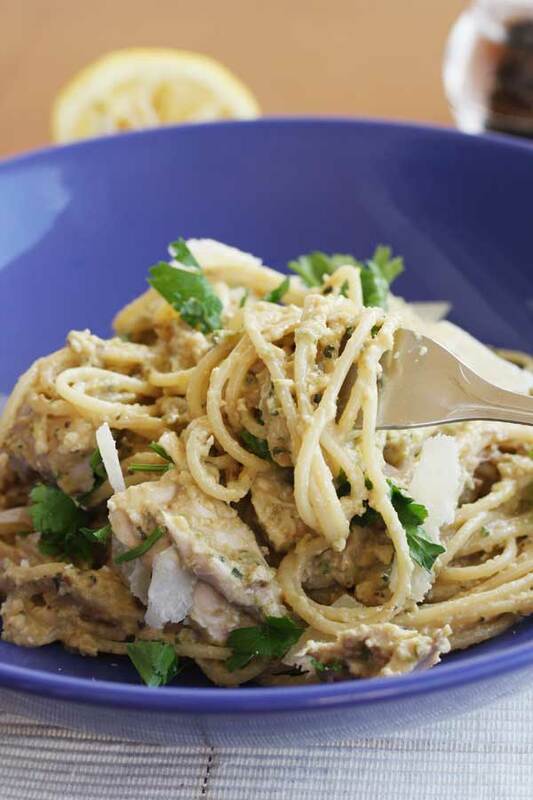 Stir the chicken and pesto sauce through the spaghetti (you may not wish to add all of the sauce, although I did!). Add a little of the reserved cooking water to make the sauce a little silkier. Heat through a little to make sure the chicken is well heated. 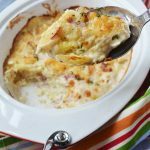 Serve immediately sprinkled with the chopped parsley and extra parmesan. Please do experiment with using this pesto as a dip ... and then write and tell me what you thought! 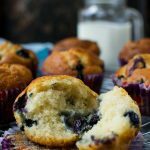 You can also find more from Scrummy Lane on Facebook, Pinterest and Twitter and follow me on Bloglovin! Thanks so much for reading! Does this look incredible, or what?! I’m so impressed with your Friday dinner ambitions. Most weeks I can muster just enough energy to pour myself a glass of wine before parking it on the couch! 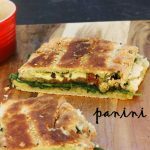 Loving the chicken in here and that pesto! Yum. LOL … you cheered me up on a slightly blah day with this comment, Alyssa! I laughed so much at you seeing your reflection in sweatpants in the bowl … hilarious! You’ve got it in a nut-shell there, Ashley! That’s totally me! Still, at least we get some yummy meals at the end of it! You killed the game with this one! What an amazing group of flavors!! Aw, thanks, Jocelyn! So lovely of you to say so! I didn’t know eggplants were called aubergine and zucchini was called courgette. You just taught me something new! This pasta looks AMAZING! Perfect for spring time. Yep, we Brits copied the French rather than the Italians on this one, for whatever reason. So happy to have taught you something today, Natalie! Wow, that pesto is a lovely blend of unique ingredients! And I am having a serious craving for this dish now. What a fantastic dinner, Helen! Thank you for saying so, Mary Frances! Somehow this just worked … I’ll definitely be making it again! I love the idea of a walnut pesto. And great use of leftovers. Cette recette me plaît beaucoup, elle est très original! Je connais le pesto traditionnel mais celui-là est extra! On ne voit pas beaucoup l’endroit ou t’habite en Athènes, le plat n’est pas asse grand!! !dommage! C’est vrai qu’on peut utiliser aussi le pesto pour des toast…Bravo! Delicious! 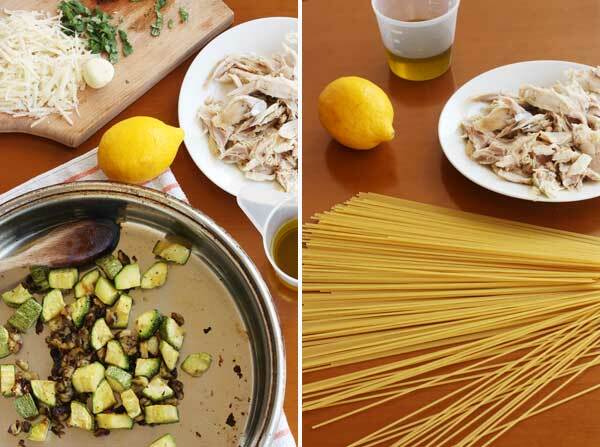 I want to roast a chicken just to make this pasta. It looks fantastic. This is my kind of meal, Helen. The combination of ingredients is fantastic! Thank you for saying so, Norma! This worked even better than expected, I have to say! Aw, thanks for following me on Twitter, Lorraine! I’m trying to get the hang of it so hopefully I’m doing OK 😉 I think this may have been my last Friday night effort for a little while! It’s slobbing on the lounge all the way from this week! Gorgeous! 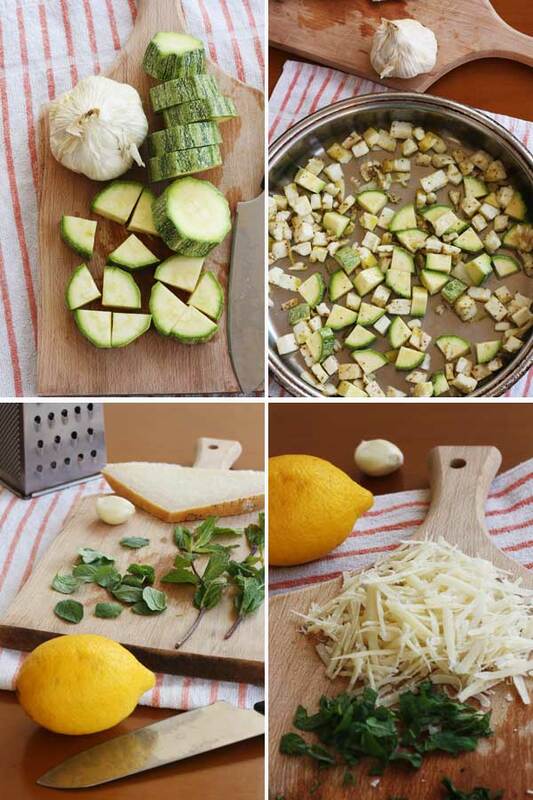 I love pesto and LOVE the sound of this! Hi Helen, what a great idea roasting the veggies and then making a pesto out of them. Brilliant actually. I have a red bowl like your blue one. It’s really pretty but a little shiny. My dear Helen wow wow wow!! I’am fond of all the ingredients in your dish. It looks so yummy and it is a complete meal. The last Time I decided to cook something on friday night instead of ordering a pizza i cooked schewy gnocchis cause I used cornstarch instead of flour. And Mr J, my boyfriend who was hungry was also finally angry!!! I finished the night cooking rice for him! Your recipe is a good idea and I like your pesto. LOL…I took photos of some tomato soup that all had a purple reflection. Nothing that even major photo editing could eliminate! I never would have noticed the reflection had you not mentioned it…I think I was too focused on the incredible pasta!! Aw, thank you, Chichi! If you remember, do let me know how it turns out if you do try making this. Hi! 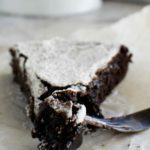 Love this recipe but my husband is allergic to walnuts, any substitutions? I really like “nutty” aspect to dishes so I’d rather not have to omit altogether. Thanks!! Hello, Laura! So glad you like the recipe. I think that you could easily use almonds or macadamia nuts in this instead of walnuts – just use the same amount. Or even pecans (which I’d say are a little like walnuts in texture). If you do end up trying it, I’d love to know how it turned out! This dish looks absolutely delicious! I love the pesto. I’m going to try this! I think this hive of Friday night cooking activity happened strictly just this one time, Cindy. Next week it’s definitely back to slobbing on the sofa with a pizza! I know what you mean about the social media thing. It’s hard to know where to stop! Sooo, you’ve joined twitter, have you tried Instagram? Twitter is actually one social media I’ve never warmed up, Instagram on the other hand, is fantastic, it’s visual and so inspiring! Gintare, I would really love to try Instagram – I suspect I’ll get REALLY addicted to that – but my phone isn’t up to it at the moment, so I have to wait a little longer for that one! Plus I’m not sure if I could cope with having to ‘attend to’ something else each day at the moment! I need to wean myself into these things gently!! I’m impressed with your Friday night cooking spirit! As for me, the heart is willing but the spirit is weak!! 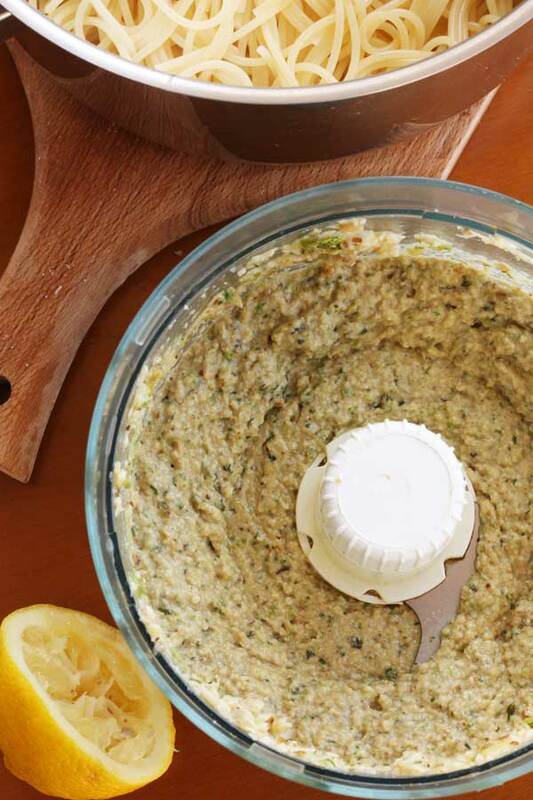 I love how you’ve combined a Greek eggplant dip with an Italian pesto! And way to use what you’ve got 😉 This looks like such a delicious meal; pinning! Aw, thanks, Allie! Great way to put it – I hadn’t really thought of it quite like that. Thanks for the pin as well! There are definitely many days I want to order takeout instead of cooking…but I really almost never regret a home-cooked meal! I love that you put that leftover chicken to good use! You’re right … I never regret the effort after the effort’s over and I’m enjoying the (hopefully) nice meal! I think I just need to be realistic about it on a Friday night. Off to eat a big plate of meatballs and zucchini fries tonight at our favourite taverna. That’s more like it! Love this pasta dish! So many delicious flavours and fusions! Thanks, Jessica! Have a great weekend! I have to agree. Usually come Friday night I just want to plop and not cook a thing. I’m so glad that it worked out for you. I didn’t know you were in Greece! I guess I haven’t been following you long enough to know where you were located. Hope all goes well with your move! Thanks for the good wishes, Melanie! Yup, I’m in Greece … been here for quite a few years, but now it’s time to go 😉 I’m excited about the next stage! Also, this dish looks delicious and the eggplant dip sounds lovely! 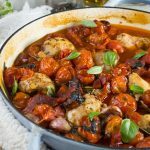 It’s funny, isn’t it, that no matter how hard we try to come up with ‘easy’ midweek recipes, there are still some nights when we just can’t be bothered and it’s as simple as that! Oh well! You have a great weekend too, Consuelo! 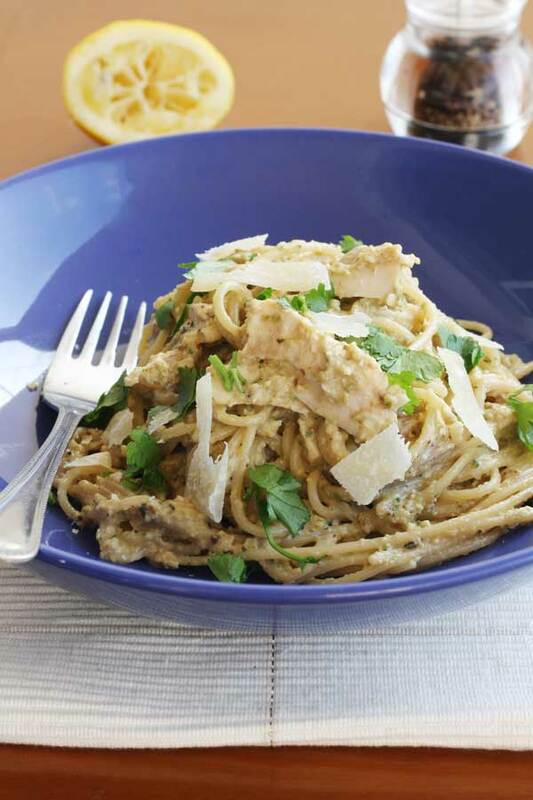 Love the flavours in this pasta dish, especially the pesto! I’m making some pesto this weekend 🙂 !! Thanks, Jessica! Hope your pesto turns out well, too! This post is literally making my mouth water! I love pasta dishes like this, and the pesto sounds incredible, I can’t wait to give it a try. Aw, you’ve just made my Saturday morning, Sue! So nice to ‘meet’ you here, and I really hope you do give this a go and enjoy it. Let me know if you do! What a creative dinner!! I can’t believe this is your Friday night work lol! I love love the pesto here. im pretty sure any form of pasta has got to be my favourite dish, even before a sirloin! Oh yum!! 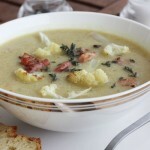 This looks like an amazing recipe!! Everything looks so fresh and tasty! Love your photography as well! So beautiful!! Oh my – this does look inspiring! I love making pestos from assorted oddments, and this one looks very good indeed! And I like the reflections on the plate – they give it a very “in the moment” feel! Pinning this for later! Hi, Donalyn, and thank you for pinning! So glad you like the pesto … and the reflections! I always forget that this blue dish does that, but ended up kind of liking the result! This. This is a great looking dish. Like, I want a big bowl of it right now… for breakfast 🙂 Nothing wrong with that, right?! Nothing wrong with that at all! Beats boring oatmeal hands-down! 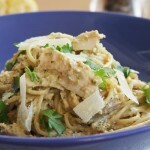 I’m always looking or new pasta meals so we need to give this a try for dinner this week! Oh my gosh – you’re so hilarious! I TOTALLY get the whole “I-just-have-this-really-simple-idea-I-will-quickly-whip-together” moment of inspiration which, by the end of an uber-busy day becomes “I-no-longer-have-one-ounce-of-inspiration-and-wish-I-could-kick-myself-really-hard-in-the shins”! 😀 Regardless, thanks for taking the hit on this one, because clearly it WAS worth it – this recipe is breathtaking! Pinning straight away! Oh – and one of my go-to uses for leftover chicken is gourmet quesadillas – so easy and you can use whatever happens to be on hand! Yum! such a beautiful Mediterranean pasta dish!